This site, a must-see for anyone visiting the Tampa area, is one of Florida’s oldest and most scenic state parks. Hardwood/sabal palm hammocks, pine flatwoods, cypress swamps, freshwater wetlands, ponds and Florida river “rapids” (a few are class II) provide valuable shelter for wildlife. 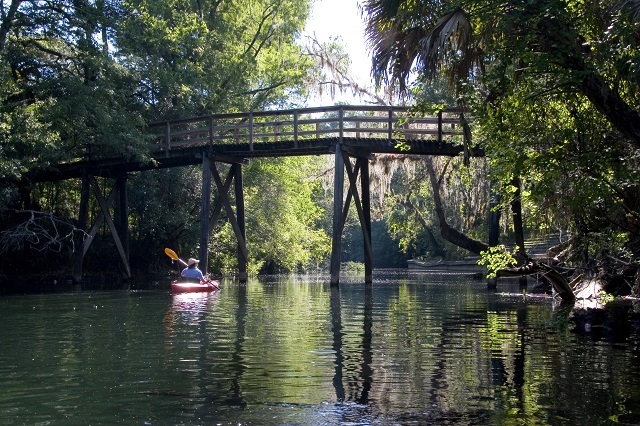 Hike the extensive trail system, or canoe downstream on the Hillsborough River State Canoe Trail, which also connects with several other birding trail sites. Look for Least and American Bitterns, as well as Wood Stork, White Ibis and Wood Duck. Search carefully among the river rocks in spring and fall for Northern and Louisiana Waterthrushes, and look in the hammocks along the river for Yellow-billed Cuckoo, Swainson’s Thrush, and Acadian Flycatcher. Seven woodpecker species can be found in the park’s woodlands, including Red-headed and Hairy. Butterfly viewers should look for hackberry emperors and eastern tiger swallowtails gliding through the trees. About 25 percent of the park lies in lowland areas which are prone to seasonal flooding; call ahead for trail conditions. Biking is allowed on the Wetlands Restoration Nature Trail and the loop road. One-hour tram tours are offered on Friday evenings and cabins and a variety of camping options are available. Bicycles, canoes and kayaks can be rented from the park concessionaire, which also operates the park restaurant.